I’ve been working with Data Studio today and realised it interprets dates a bit more strictly than charts in Sheets. I thought I’d share what I did – and its reminder to pay more attention to managing dates. Firstly, I had a simple table of dates and a value for each month. 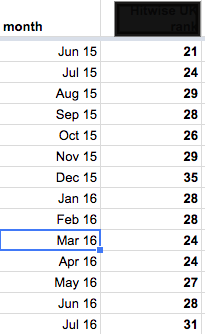 In Google sheets, I’d used a *dd/mm/yyyy* formatted date which I have displayed as, for example, **Mar 16**. Linking this sheet to Data Studio, I found, not surprisingly, that the dates were displayed back as a full *dd/mm/yy* format and that some days and months were switched. My second challenge was to convert a text date into a month and year date that Data Studio could interpret. Finally, format the date again to yyyymm. This allowed Data Studio to interpret and display the data correctly.